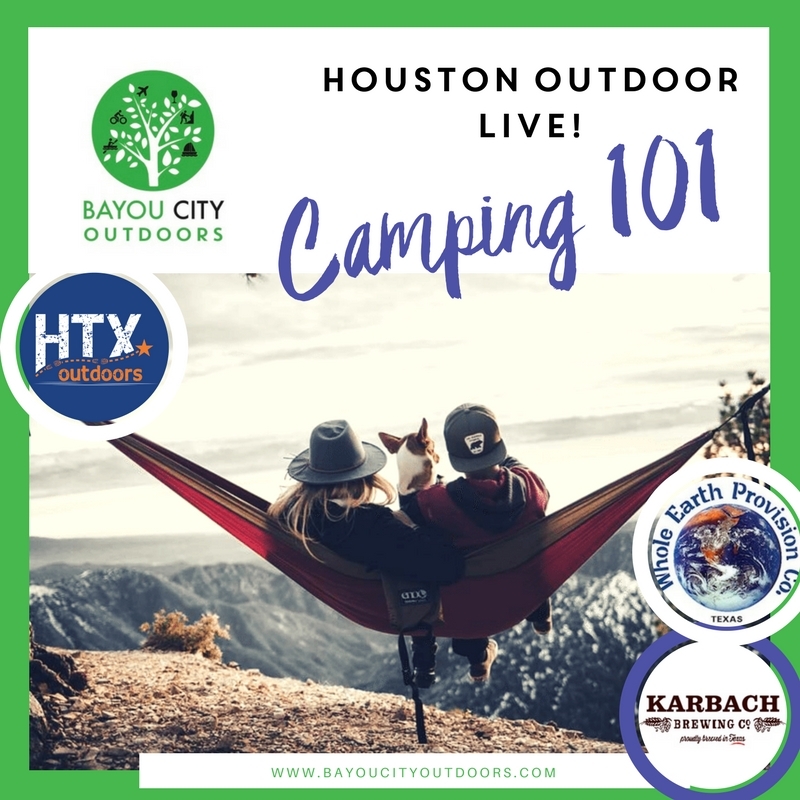 Join us in person, or check us out online via our Facebook LIVE event on the BCO Facebook page (www.facebook.com/BayouCityOutdoors/). Both events run simultaneously, and you can join the Q&A online or in person. If you do happen to drop in, you have the chance to win some very cool giveaways compliments of Whole Earth Provision, including a Grilliput portable camping grill and the new camp cookbook! Plus, we’ll have refreshments provided by Karbach Brewing Co. and other snacks. The giveaway will be held at the end of the presentation. Houston may not be known as a camping mecca, but travel an hour any direction, and you can find yourself sleeping under the stars. Join us for Camping LIVE this month, where you’ll learn everything you need to know about camping to make you feel like a pro (or at least an Eagle Scout)! Ever heard of car camping, primitive camping or backpacking, and wondered WTH? We’ve got you covered, and you’ll be picking your site with confidence in no time at all. We’ll also review equipment you will need and don’t need, demonstrate different tents, show you how to set it all up, and share our favorite camping gear. You'll also be able to download our free “10Essentials for Camping” that evening - we promise to get you camping in style! This tip sheet covers everything from camping 101 to pro tips, plus a few of our favorite Dutch Oven Recipes to salivate over. With this sheet and your Camping101 knowledge, you’ll be ready to spend any Memorial Day weekend under the stars. Don’t forget to sign up for this evening at the event for the drawing of a Grilliput camping grill and the new camp cookbook.